I will not budge on two things. First, of Richard Kelly’s Three Components of Light, ‘play of brilliants’ is the best element of lighting design (who doesn’t love sparkle?). Second, smartphones are not light meters. Say it again with me. Smartphones are not light meters. Yes, again, but with feeling this time. Smartphones are not light meters. There are dramatic differences between smartphone light meter apps and standalone light meters when used in the lighting world. As a lighting professional, I’ll show you how and why leaving this unitasker at home can have serious implications. A light meter is a tool that measures illuminance. Illuminance is what lighting geeks call “light-levels” or the incident light on a surface. It has units of lumens per square foot (footcandles) or lumens per square meter (lux). A lux is about one-tenth as ‘intense’ as a footcandle (thanks to the ratio of a square meter to a square foot).Search ‘light meter’ or ‘lux meter’ in the Google App store and you’ll get a list of apps that promise accurate illuminance measurements. These apps were originally intended to help photographers configure their fancier DSLR cameras to take photos that are well exposed – not too bright, not too dark. Photographers can use an independent light meter to configure their camera. Anyone who knows a photographer knows that a photographer’s perceived quality of work is tied to how many accessories they haul around from job to job, right? But a light meter is not a mission-critical device for most folks. They can nudge their camera settings and still generally get a good shot. And, if all else fails, there’s always Photoshop. Lighting professionals have a lot in common with photographers. There are tools of the trade we may need while we’re on site. And we’re usually carrying around a pad, clipboard, or tablet for our notes. A camera for documentation. A tape measure or laser range-finder for distances. And of course, our phone for sharing what we had for lunch … I mean for contacting site personnel. If we could combine a few of those together – why wouldn’t we? Lighting professionals deal with mission-critical lighting measurements that have implications for safety and public health. Our light meters may be used to evaluate sufficiency of egress lighting, calibrating or commissioning a lighting control system, evaluating whether a contractor or start-up agent has done their job adequately, or whether they need to revisit the site for additional modifications. An energy auditor may use it to help decide what areas could be delamped or retrofit with a new luminaire. These measurement scenarios have real-world, bottom-line repercussions if the measurements are not right. So how DO light meter apps perform? In this chart, the calibrated meter reading is measured on the x-axis and the app results are reported on the y-axis. We see the light meter app readings overlap significantly around the target illuminance value, but still significantly report reading either too high or too low. At 300 lux (30 fc) and 500 lux (50 fc), the apps report between 20 lux (2 fc) and 1000 lux (100 fc). My calibrated, NIST-traceable light meter is ±3% of reading, which means if I measured 300 lux (30 fc), the real value is between 309 lux (31 fc) and 291 lux (29 fc). That’s a whole lot less uncertainty and far more practical for determining whether I should make recommendations to recalibrate a lighting control system or retrofit an existing lighting system. Why are they so different? And what’s a light meter, anyway? These three components must be designed and specified for one another. The cosine correcting lens must be sized to fit the light sensor. The luminosity filter needs to reduce the specific wavelength sensitivity of the photodiode until the combined output matches the photopic luminosity – V(λ) – function. And the photodiode has to output a range of values that can be measured accurately and repeatedly. This is no small task. How does a light meter app work? A light meter app incorporates two components – the physical measurement using the phone camera and the software processing of the camera output. Yes, there are plug-in dongles and devices that can measure light, but they’re not the subject of this discussion. We’re talking only about apps that rely on the camera. Before light even gets to the camera, a light meter application is already off to a rough start. When the cellphone camera is active, an image is recorded on the charge-coupled-device (CCD) or complementary metal-oxide sensor (CMOS), as each individual photon impinges on each sensor. Each unique sensor will have a specific sensitivity to the spectrum of light it is most sensitive. Given the sheer breadth of cellphones available, it is very unlikely app programmers are characterizing individual sensors. Furthermore, many camera manufacturers regard the spectrum sensitivity and filtering approach to be a trade secret, obscuring the accuracy of what the sensor is physically metering. Even among professional DSLR cameras, there are significant differences between individual camera sensors – different between brands and even models. It’s entirely reasonable to assume that consumer-grade, inexpensive cameras included in cellphones would suffer even worse performance. Depending on the mobile platform (e.g. Apple vs. Android), the ability to send API calls from the app to the camera (mostly a function of programmer effort on modern mobile platforms), and the programmed camera response; the settings for the aperture, shutter speed, and ISO setting could all result in some degree of over- or under-exposure of the camera sensor, providing flawed data to the app. Each pixel of data is encoded in to an RGB value (normalized between 0-255, often referred to as the sRGB transfer function, or gamma). This normalization process creates a potential resolution errors (constraining an analog value to an 8-bit digital structure). Depending on the phone manufacturer, the transfer function may enhance certain regions of the spectrum to make colors in images appear more vibrant or prettier on the phone screen. This vibrancy-enhancement makes pictures look attractive to consumers, but distorts the scientific measurement of light. Depending on how the camera manipulates the image data, the camera may store the file as a .raw image (uncompressed) or as a .jpeg or other image file (compressed). The compression process usually further distorts the accuracy of each RGB channel. While DSLR cameras support .raw image capture, most cellphones compress the captured image in order to conserve space. In this case, we’d expect similar (but slightly different) compression artifacts to occur on both sets of platforms. Each sensor has many, many individual pixels (usually measured in millions, i.e. megapixels). The cellphone app then performs mathematic averaging function, grouping pixels together and using a well-known transformation to covert individual RGB coordinates into CIE-Y, which is a spectrum weighting function very closed to the photopic sensitivity curve, V(lambda). 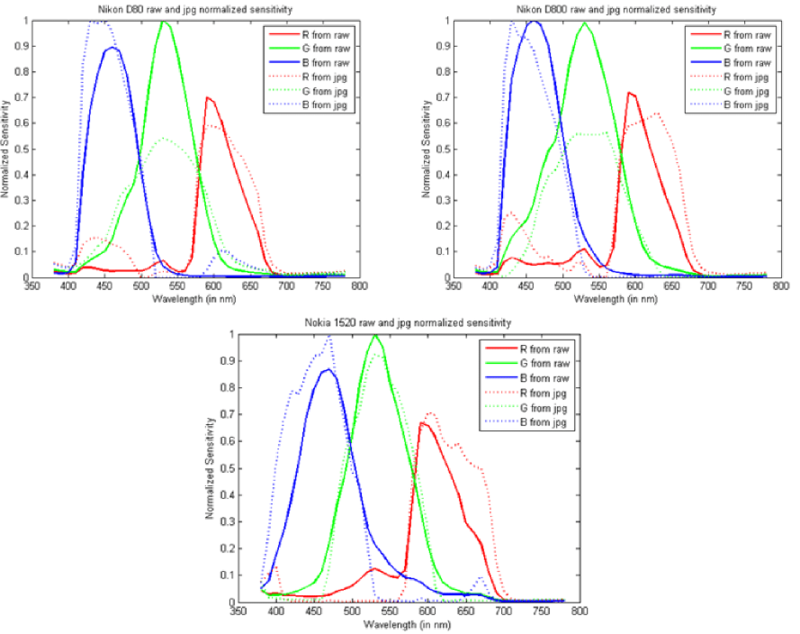 If your space does not have a uniform color temperature (say a office adjacent to a window, with 3,500K electric lighting and 6,000K from daylight), the averaging of the various pixel groups may not accurately measure what the human eye perceives in the space. With each of these steps, tiny errors are injected into the process. One or all of these factors could bias the reading of the light meter app and generate a false reading. A smartphone does a lot of stuff in the field. It can take pictures, record field notes, and doubles as a reasonably good bubble level. A smartphone is not a light meter. A lighting professional – be they a designer, consultant, manufacturer rep, installer, or start-up technician – has too much on the line to draw conclusions based on a faulty light meter. A smartphone light meter app has too many levers involving too many unknowns that cannot be reasonably accommodated by either the programmer or via a ‘calibration’ function. Light meter apps based on my experience and the experience of others fail to correctly measure light when compared to calibrated light meters designed for that purpose. Avoid the guess work and invest in a good light meter and treat it gently. How do you buy a good light meter? We’ll discuss buying a light good light meter and the impact it can have on your lighting projects in a future post. Illuminance for Occupational Health and Safety Purposes?,” Advances in Intelligent Systems and Computing, Issue 604 2018, pp. 258-268. [ii] J. Jiang, D. Liu, J. Gu and S. Süsstrunk, “What is the space of spectral sensitivity functions for digital color cameras?,” 2013 IEEE Workshop on Applications of Computer Vision (WACV), Tampa, FL, 2013, pp. 168-179. [iii] C. Matasaru, “Mobile Phone Camera Possibilities for Spectral Imaging ” Master Thesis Report, University of Eastern Finland, Joensuu, Finland, 2014.